The time can't wait for you. 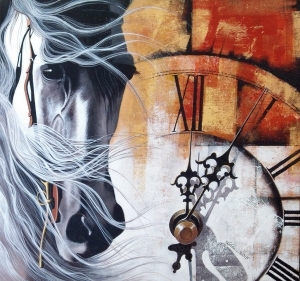 In her painting, the artist tries to represent the value of time in our life. That's the way, she came up with this painting on chasing the time.Everyone wants to keep time in his/her pocket. But you can keep a fob watch in your pocket but not the time. The tools to check time is not time itself. 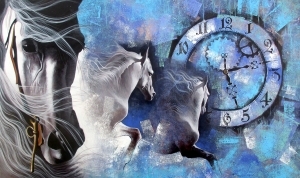 time like horse is very strong and runs very fast, faster than we can keep pace with it.